This picture was taken this morning. I am driving this tractor around in icy rain, soaked to the skin, and I am ecstatic! I finally have a workable system for hauling heavy loads of material over uneven terrain without risk of personal injury. 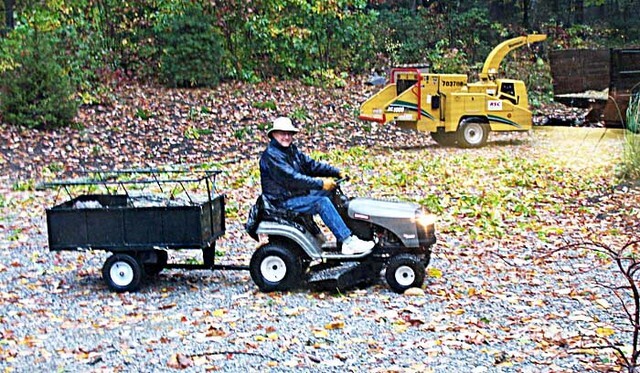 I have been working on acquiring a miniature tractor / dump cart combination for hauling firewood for almost a year and this was what I had envisioned. Once I really set my mind to it, everything started happening at once. I licensed my book, Danger Quicksand – Have A Nice Day, to a Russian publisher and the licensing fee gave me the chance to purchase what I needed. I didn’t have time to search for what I needed, so I enlisted neighbor Tom King, bargain hunter extraordinaire, to help me. After a short search, he found me this stellar bargain at Sears. I am driving a new, "discontinued model" Craftsman lawn mower with a 18 HP engine and a sturdy dump cart from Lowes. The whole package came in at around $1000 and it allows me to haul half-ton loads of firewood logs around our property. Once I had a working tractor and a heavy duty dump cart, a lot of stalled projects started moving again. I had an arborist take down a tree this morning and in the image above I am hauling cartloads of logs around to the log splitter where they will become firewood this weekend. I was able to remove most of the tree trunk sections in less than an hour. The tree people used the chipper to dispose of the branches and leaves. The high sided dump cart will carry 1000 pounds which is adequate for hauling small loads of topsoil, mulch and gravel around the property. This tractor/cart combination speeds up landscaping chores immensely and lets me clean up odd piles of building materials that I have been avoiding for many months. I do not have a lawn so the mower deck will soon be dropped and stored somewhere which will give the tractor a much higher ground clearance and will make it more useful in the woods. My next project is to find out if there is some kind of snow blower attachment that I can bolt onto this tractor for use in clearing the driveway this winter. I don’t think there is enough power to push a plow, but a self-powered snow blower attachment might come in handy, if such exists. This entry was posted in Country Living and tagged dump cart, lawn tractor, snow blower attachment. Bookmark the permalink. Cute! You look like your having way too much fun. Happiness is having your own lawn tractor that starts every time. Congrats on the book deal, and if you are not using it, I could use the tractor this winter to plow my driveway. I like your quote about happiness. I’ll include in my website. Check it out if you have a chance.